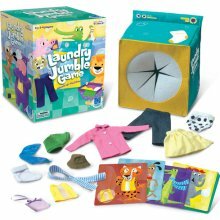 The Laundry Jumble Game is our Pick today, being offered all week at a 15% discount. We LOVE this game! Beautifully illustrated cards with various animals tell users which article of clothing they need to find. Reach into the dryer to find the piece of clothing that matches the card using only your sense of touch. Make a match and you can keep your card. Watch out for the Skunk’s undies though! Draw that and you lose a card. This is a fun and engaging game that encourages tactile exploration and fine motor skills with laughter. Save 15% on the Laundry Jumble Game this week only by entering the Promo Code BLOGLJ2 at checkout. *Offer expires on September 27, 2011 at 11:59 pm EST. Not compatible with any other offer. Be sure there are no spaces after the Promo Code when you enter it at checkout. Written by: Different Roads to Learning on September 23, 2011.on October 4, 2011. This entry was posted in Difflearn Promo Code, Pick of the Week, Products, Resources, Sale and tagged Different Roads to Learning, generalization of skills, Matching & Sorting, Resources, teaching, teaching tools by Different Roads to Learning. Bookmark the permalink.